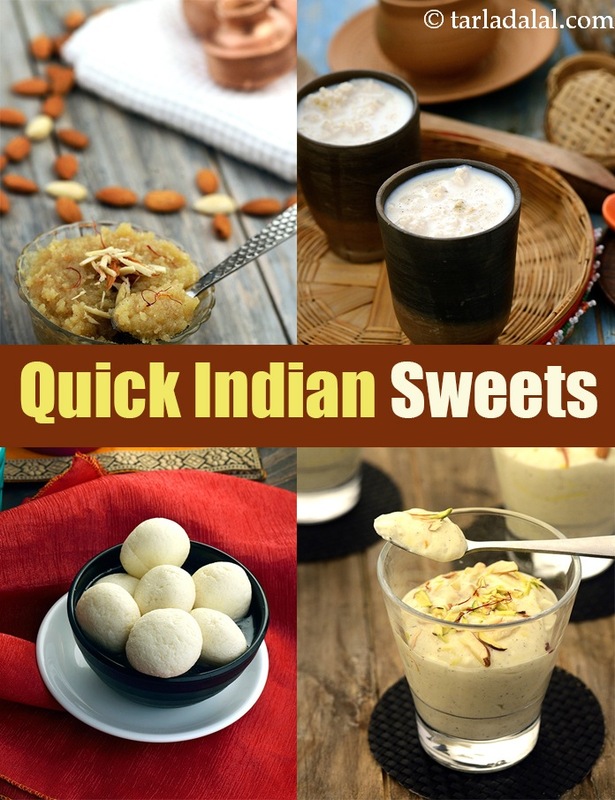 Quick Sweet Recipes, 300 Quick Indian Sweet Recipes, Mithai. Even those who believe in their ability to cook a meal quickly often get flustered at the thought of making sweets and desserts in a hurry! This section is here to prove to you that some of the most delicious desserts can be made quickly and easily, using conventional cooking methods. These no-fuss recipes cater to the chocolate lovers, with recipes like Almond Rocks and Chocolaty Balls, to the traditional food lovers, with Indian mithai like the Instant Rabdi and to the nutritional needs of kids with interesting recipes like the Date and Nut Slices. Whether you wish to surprise your kid with a sweet in their snack box or treat your brother to some amazing mithai on Raksha Bandhan day, take your pick from these easy and quick options. Kheer is a traditional Indian dessert made by cooking rice grains in milk. Quick Rice Kheer, Microwave Apple Kheer take less than 15 minutes to cook. Also, Rabri an authentic sweet made by reducing milk for many hours can also be made instantaneously by adding bread slices to thicken the milk. Quick Rabdi tastes amazing with Gulab Jamun, Malpua because of the subtle flavours. Besan Laddoo ( Microwave Recipe), Quick Mava Peda, Rose Barfi, Shrikhand are some other delectable Indian mithai that can be made quickly! Soft, melt-in-the-mouth Bengali sweets like Rosgulla and Chum Chum are loved by all. Though making them requires a lot of patience and also, time to learn the skill of kneading them and turning them into fluffy as cotton balls, white as the moon. The most important component to master the perfect Bengali mithai is to get the chenna right! Chenna is made by curdling full-fat milk and resembles Paneer, just that the moisture content is retained while draining. Forget store-bought Rasgulla and try this quick method of making spongy praise-worthy Rasgulla at home from scratch! Also, you can whip up some delectable Sandesh using paneer. Quick Apple Sandesh made with paneer and sugar, finally topped with a tangy apple mixture is indeed a perfect balance of tradition, modernity and convenience! Channar Payesh is a classic Bengali sweet dish made by reducing milk and adding chenna to it, here we have given it a peppy twist by adding citric orange segments to create lip-smacking and quick Orange Chennar Payesh. Also, you can make this Quick Orange Sandesh by mixing orange essence and orange squash with paneer. Another, unique and modern variation of traditional Bengali delicacy is this Layered Fruit Sandesh. The combination of crunchy, tangy fruits layered with sweetened and spiced paneer is tongue-tickling! Sheera is a popular semolina based Indian sweet. It is generally made by roasting semolina and then cooking it with milk and adding sugar but, the flavor can also be enhanced by adding spices like saffron, cardamom or fruits like pineapple, banana and other ingredients like cocoa powder and butterscotch syrup to make a wide range of delicious sheeras. Rava sheera is a traditional, yet modern Indian sweet and a delightful treat that can be made in a jiffy. Also, try this fruity Pineapple Sheera, Mango Sheera whose rich flavor will linger in your palate and overshadow the glory of even the best Main Course! Instead of rava, you can even use crushed dry fruits to make rich sheera with unique texture and flavours. Badam ka Sheera, Walnut Sheera or this Layered Sheera with layers of walnut, almond and cashew sheera arranged and served in a phenomenal way are some rich treat which hardly takes any time to cook! Whole wheat flour, Waterchestnut flour can also be made into soft, lumpy Atta Ka Sheera, Singhada Sheera with a fabulous colour, texture and flavor. Garnish them with slivers of nuts, to add to the sumptuousness of this delightful desserts. To make it healthy, you can combine together whole wheat flour, nachani and soya flour to make Healthy Sheera. Halwa is a delicacy that no one can resist, thanks to its rich, sugary taste and enticing, melt-in-the-mouth texture. It can be prepared in minutes and requires hardly any advance preparation, and can be whipped up even at short notice. Similar to sheera, it can be flour based, nut-based or vegetable based. Doodhi Halwa and Gajar Halwa are two popular Halwas which are simply irresistible and are found everywhere from restaurants, mithai shops to parties and weddings. Authentically, they are made on a slow flame in a deep pan but, we have got quick variants for you to make in a microwave or pressure cooker. Doodhi ka Halwa ( Microwave Recipe ), Quick Gajar ka Halwa made with a handful of ingredients in the right proportions can be made within few minutes. Also, you can try Shakarkand Ka Halwa that can be consumed during fasts or a combination of vegetables mixed to make Bottle Gourd, Carrot and Beetroot Halwa or this Jhat-pat Halwa made with very few ingredients. Ditch your generic savory breakfast and cook these quick, sweet breakfast delicacies like Waffles with Butter and Honey, Banana Dosa or Mini Banana Sesame Pancake. You can even top the waffles/ pancakes with whipped cream, chocolate sauce, mango sauce or chopped fresh fruits. Mouthwatering treats like Frozen Muskmelon Yoghurt, Layered Oats and Rice Porridge, Healthy Mango Yoghurt can surely pep up your mornings! Forget your store-bought jams loaded with ample amount of sugar and preservative and make your own jams like apple jam or Pineapple Jam and enjoy them with a slice of toast. A box of handmade sweets, lovingly prepared by you, is perhaps the warmest way to greet a special someone. And if you have not been doing this, under the assumption that chocolates and sweets are tough to make, then here are some easy recipes. Chocolaty Snowballs, Chocolaty Balls, Mixed Nuts Chocolate, Crispy Chocolate Balls are some delights that you must try! End your meal on a sweet note and relish this Chocolate Coated Strawberries with contrasting flavors that will simply blow your mind and taste buds! Forgot a special occasion, guests arrived suddenly at dinner time, kid or spouse back home with some good news, or are you simply in a great mood? Well, you do not have to hesitate to celebrate, when you know how to prepare desserts like Strawberry Soufflé, Chocolate Pani Puri, Chocolaty Biscuit Cake. Enjoy our Quick Sweet Recipes, 300 Quick Indian Sweet Recipes, Mithai and other quick recipe articles below.